Fox’s Monday Pizza Happy Hour! Now you can look forward to Mondays! As a special thank you to or wonderful customers, join us from 4-6pm Mondays at Fox’s to enjoy your favorite gourmet pizzas and oven baked calzones for 1/2 price! Valid for dine in or carryout. Let you friends know about the community deal of the week! 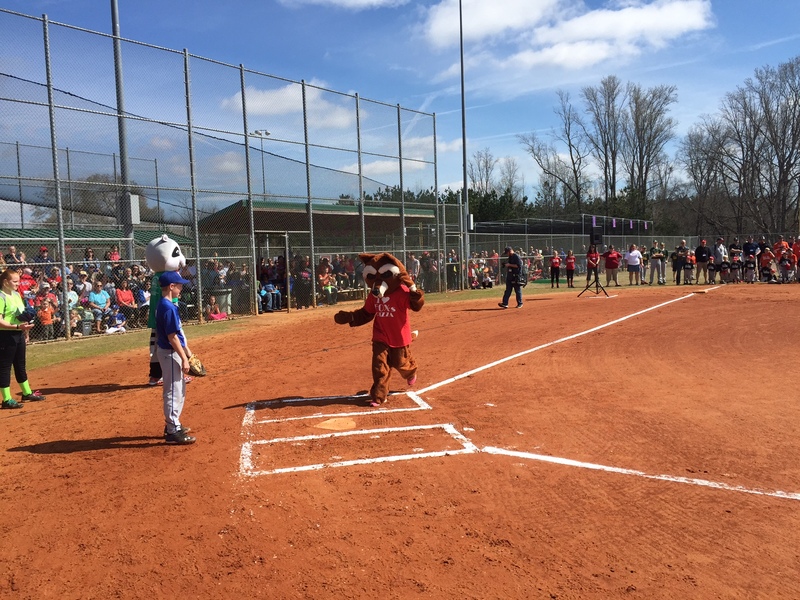 As a supporter of area Little League programs, we were happy to be a part of the 2014 Oconee County Little League opening day! 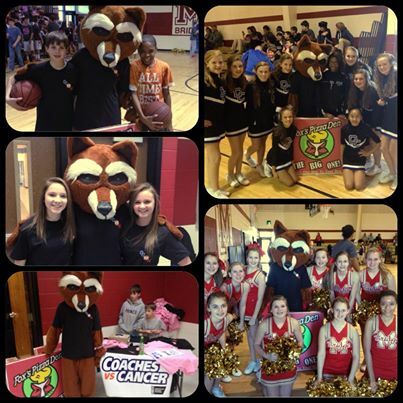 We had a great time getting to meet the Fox’s team and so many others, and compete in the mascot challenge. Way to go Frankie! It’s awesome to be a part of the program and see the growth in our community. Good luck to all area teams this year, and we hope you have a great season! Make plans now at Fox’s for your end of season team parties! 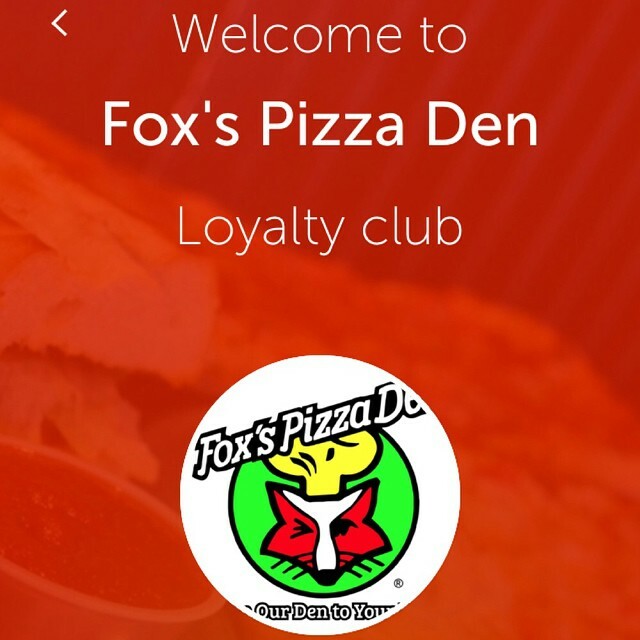 Have you added the new Fox’s reward app from Flok to your phone? If not, you’re missing out on starting a phone based rewards card, staying updated on all our current specials and coupons, checking in to earn status cards, sharing photos and more! Search for Flok in your app store or visit http://www.Flok/app for more information and search for Fox’s. You can also get more information on our recent blog post. We’re excited to introduce Fox’s Double Reward Wednesdays! For a limited time, receive double the normal stamps on your Fox’s phone rewards app. You’ll be on your way to saving even faster! Please let friends know about this new program, and share the savings and fun. We love our community, and are happy to support where we live and work through good works, community events, and exclusive fundraisers. 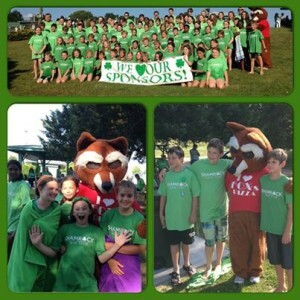 Do you have a an upcoming special event or group with fundraising needs? 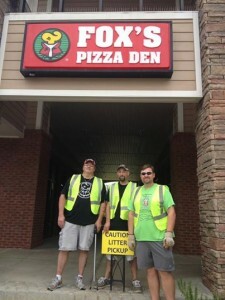 Give Fox’s a call 678-661-0220 or email david@foxspizzaoconee.com. 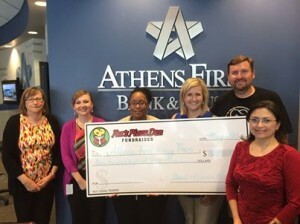 Check back for updates on Team Fox Rocks here on our Athens and Oconee community blog. April 24 2015 – Fox’s Friday! One week from tonight we’ll be with our friends raising funds for the 2015 Relay For Life of Oconee County! Special music from Patrick Britt Music too! See you then! April 19 2015 – We enjoyed seeing everyone for dinner before prom last night, and hope you had a wonderful time there! 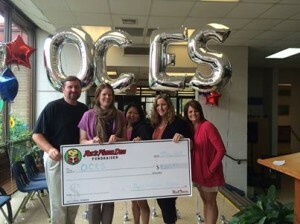 Fox’s is happy to support Oconee County After Prom! March 27 2015 – 2015 Mustang expo tomorrow/Saturday 4-6pm! 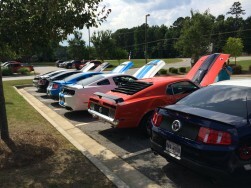 Register your Mustang, or simply stop by and check out the hot rods! March 22 2015 – Happy to partner with Oconee County Little League on opening day! Frankie had so much fun running in the mascot race. We loved being able to meet the Fox’s team. March 20 2015 – Congratulations to Ms Dickens’ OCES class. Your Pi Day awareness pizza box was the people’s choice! We hope you enjoy your 30″ “biggest pizza in town” party! March 16 2015 – Team Fox Rocks couldn’t be happier to display this t-shirt quilt made by Fox’s Aunt Jackie, featuring all the 5k fundraisers from 2014! Thanks from the Fox’s team! 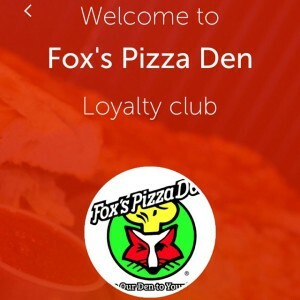 March 8 2015 – Frankie the Fox’s Pizza Fox! had fun listening to stories for Dr Suess day at Target of Athens and meeting lots of fun people. Photo courtesy our friend Claire G! March 1 2015 – Stop by and enjoy delicious Fox’s Pizza and show off your pizza dough tossing skills at the Taste of Oconee tonight 5pm at the Oconee Civic Center. We hope to see you there, and please vote Fox’s best in Kids Choice and People’s Choice! 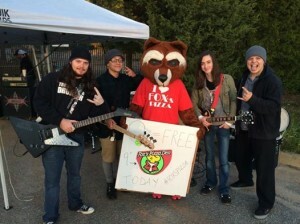 February 22 2015 – Frankie the Fox’s Pizza Fox! 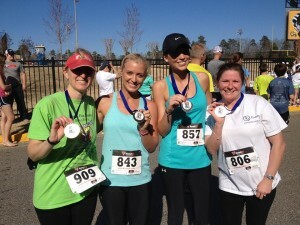 had so much fun at the Athens Montessori School 5k! Call to inquire about the fox at your next event! February 5 2015 – We were honored to participate in the OCES Career Day today, and enjoyed talking with such insightful students! January 30 2015 – Fox’s Friday! 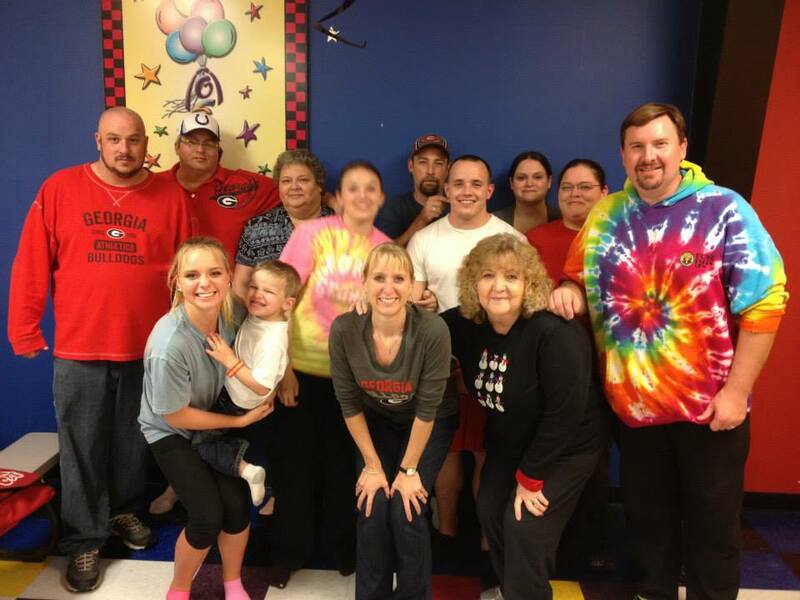 Happy to host our friends from Extra Special People, Inc. on their Fox’s fundraiser night! Make plans to attend their Big Hearts event Saturday, February 7th! January 15 2015 – Good times with future leaders from the Oconee County Chamber of Commerce Youth Leadership Oconee, enjoying a Fox’s 30″ “Biggest Pizza in Town” dinner! 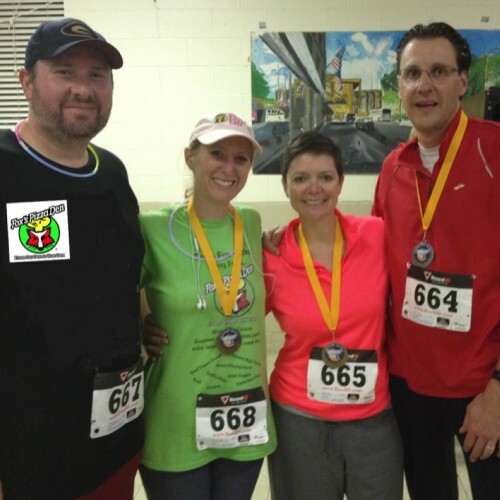 December 20 2014 – Team Fox Rocks with a first on a chilly day… Santa Stroll 8k to benefit Bishop Baptist Church. Some of us even medaled with a Santa bobble head! Great job team! December 17 2014 – Happy to provide Fox’s “Biggest Pizzas in Town” to the Athens Area FCA football all-stars after practice… Game time Friday 7:30 at Clarke Central! November 21 2014 – Fox’s had fun talking to students about their future and demonstrating our training dough at the 2014 Career Day! November 9 2014 – Congratulations to the UNG Oconee honors program on a successful Fox’s pasta dinner fundraiser! 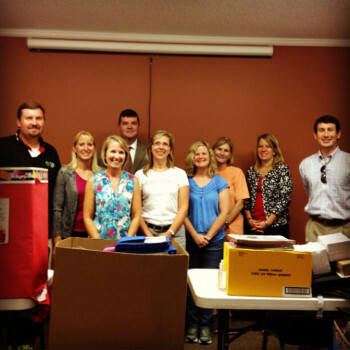 We were glad to partner with you to help raise nearly $500 for your program! 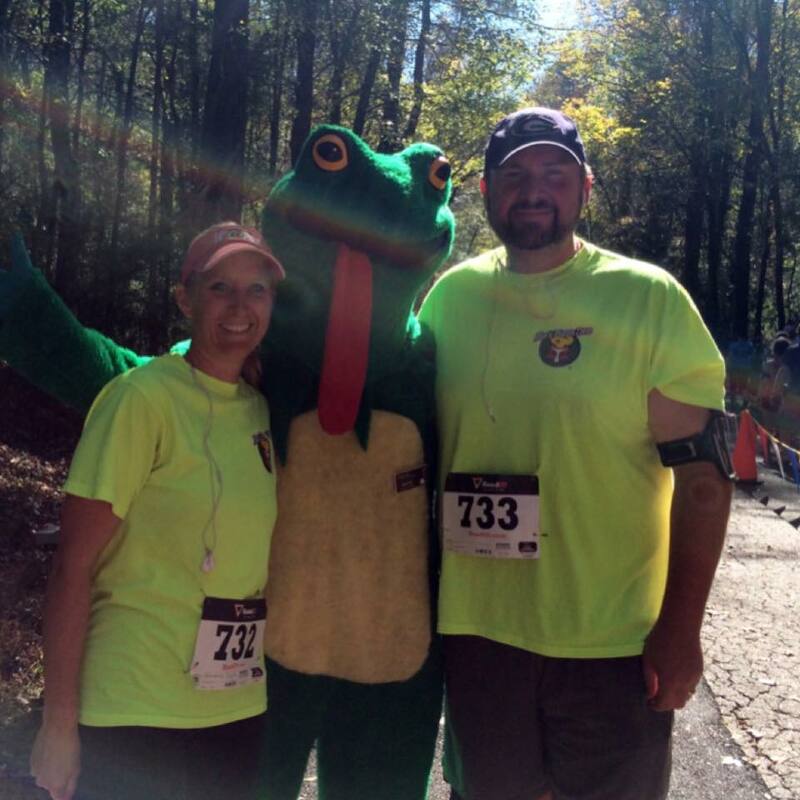 October 26 2014 – Team Fox Rocks supporting the Sandy Creek Nature Center at the Jack-O-Lantern Jog 5k! Beautiful course along the greenway… Now time for celebratory Italian favorites! October 19 2014 – Congratulations to all AthHalf Half Marathon runners! We had so much fun cheering you on along with our friends The ATHENS band. 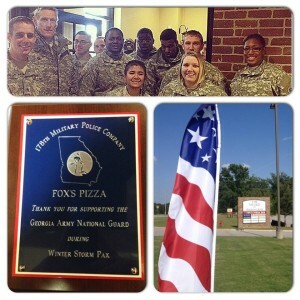 We’re proud of all of you and hope to see you at Fox’s for a celebratory pizza! Thanks to everyone that enjoyed lunch or dinner in support of Team Lake and the Be the Match Foundation. — at Fox’s Pizza Den of Oconee. 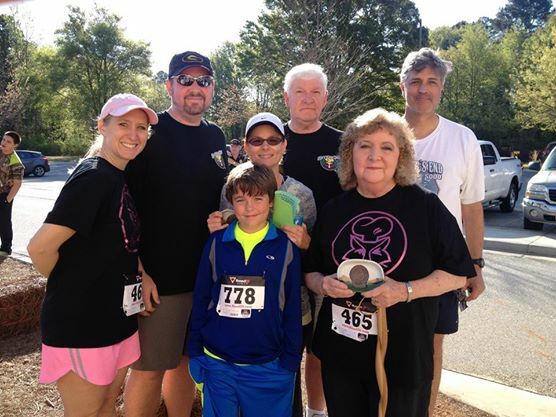 September 5 2014 – Fox’s was happy to be a part of the Jeannette Rankin Women’s Scholarship Fund 5k Saturday! There was FREE Fox’s for finishers, plus runner and walkers got their photo with Frankie the Fox’s Pizza Fox! August 6 2014 – There’s nothing like the excitement and energy of a new school year! 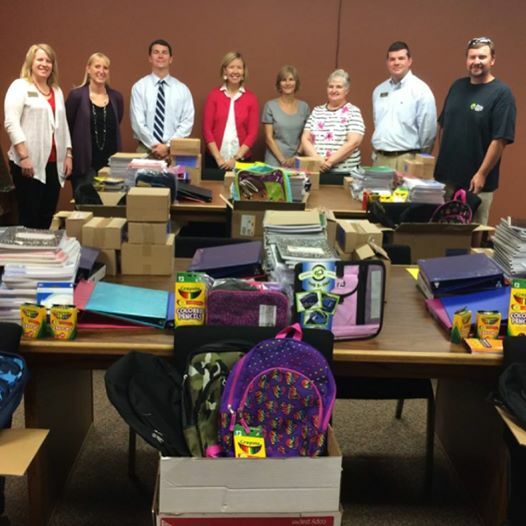 Many thanks to everyone supporting the Fox’s and Oconee County Chamber of Commerce school supply drive! 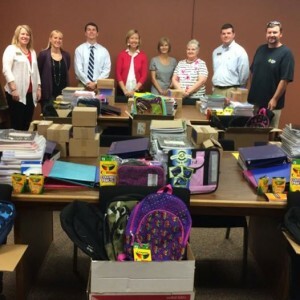 Your record breaking generosity helped make this a special day for lots of area students. 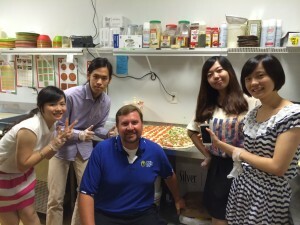 July 16 2014 – Please welcome our Fox’s interns from Shanghai University via the University of Georgia! Stop by and say hello to Elaine, Joy, Max and Summer. We have some exciting events planned by our interns, so check back for details. 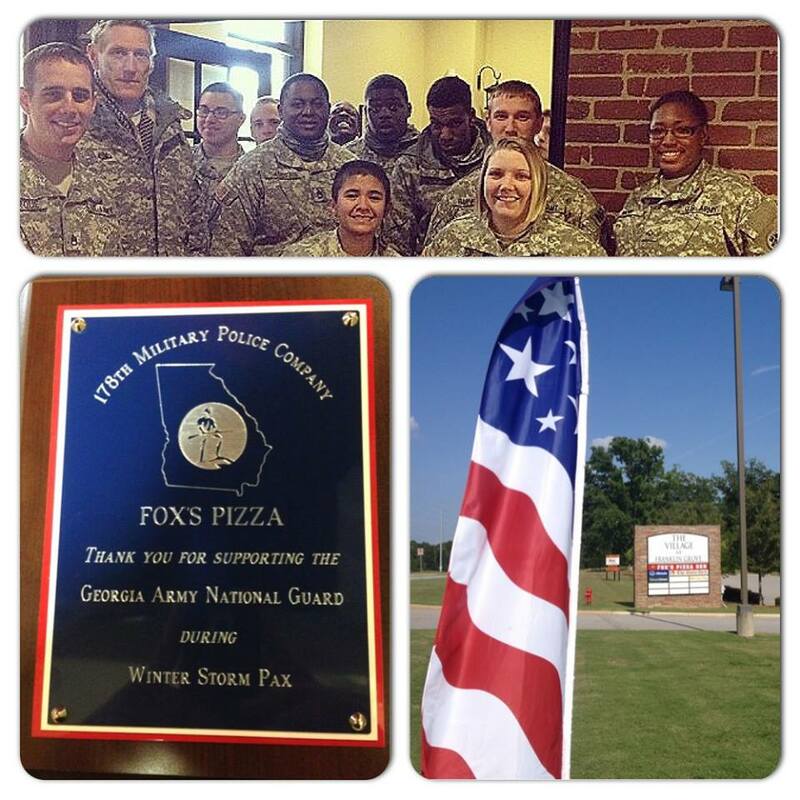 July 3 2014 – We were surprised with a timely visit to Fox’s from the GA Army National Guard to present this plaque! Open tomorrow from 4-close, plus come to the Oconee County Parks and Recreation Department fireworks hungry… We’re the on site pizza provider! Happy 4th! 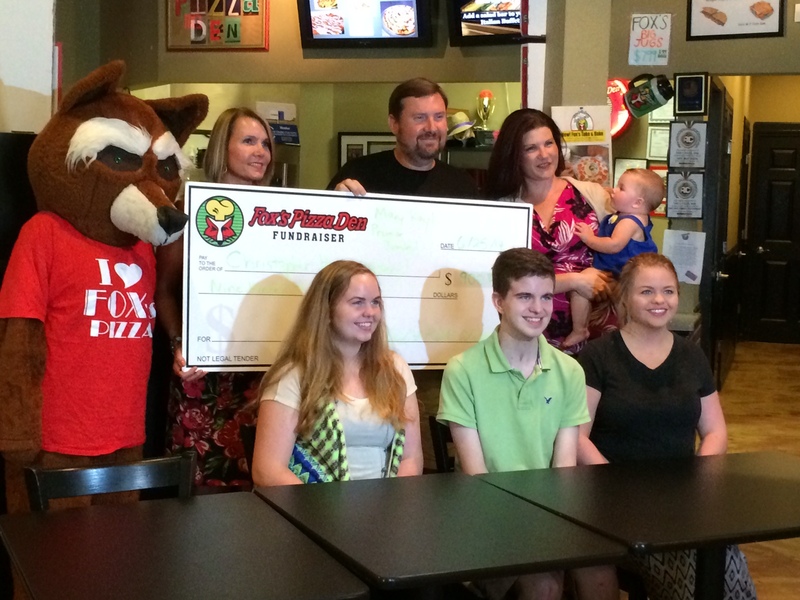 June 26 2014 – Chris Hein and his family stopped by Fox’s yesterday for the big check fundraiser presentation! Thanks to the support of community and a combined effort by local businesses, we plan to be able to raise $1,000! Premier Jewelry and Mary Kay fundraisers are about to wrap up, but you can still participate by making purchases to support the Heins! Click the previous highlighted links for more information or visit Chris’ fundraiser page to donate as well! 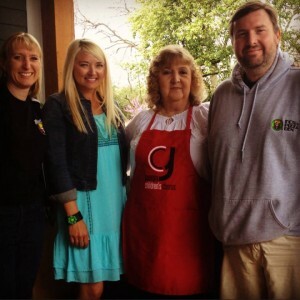 June 21 2014 – The inaugural 2014 Mustang Expo fundraiser was a huge success! Special thanks to all the local businesses that helped make this happen, and to everyone that came out to support the Chris Hein Recovery Fund. We had about 20 Mustangs participate this year, and really enjoyed catching up with regulars, while meeting new friends! In case you missed it, you can see more photos from the event in our event photo gallery! May 23 2014 – We were happy to get the chance to provide pizzas and pastas for National EMS Week! Thanks to all first responders for all you do! May 19 2014 – Happy to be a part of Oconee County Elementary School Cultural Arts Night with a fundraiser dinner! Call us to RSVP Fox’s for your next event! May 16 2014 – We’re excited to partner with the Shamrock Seals to be their pizza provider! Frankie the Fox’s Pizza Fox! had a great time at their kickoff. Need pizza or a fundraiser idea for your pool or swim team meets or parties? Give us a call! May 10 2014 – Team Fox Rocks cleaning up Hwy 78 as part of the Keep Oconee County Beautiful Commission day of service! Now on to the Oconee County Parks and Recreation Department Movie in the Park! Pick up dinner at Fox’s, or we’ll have slices at OVP! 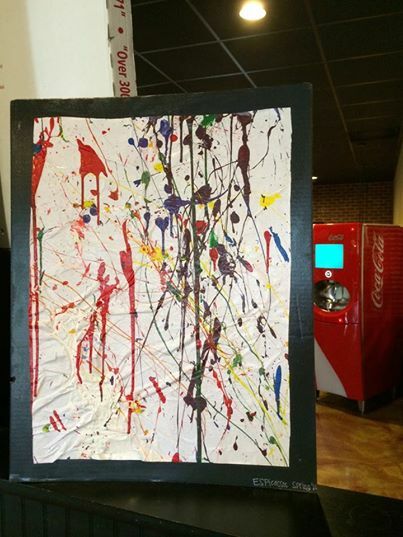 May 9 2014 – Check out the new local artwork at Fox’s, created by talented artists at Extra Special People, Inc.! We were lucky to receive this at a recent fundraiser, and will proudly display this art from our friends at ESP! May 5th 2014 – Team Fox Rocks at the St. Mary’s Health Care System Next Step 5K for stroke awareness! 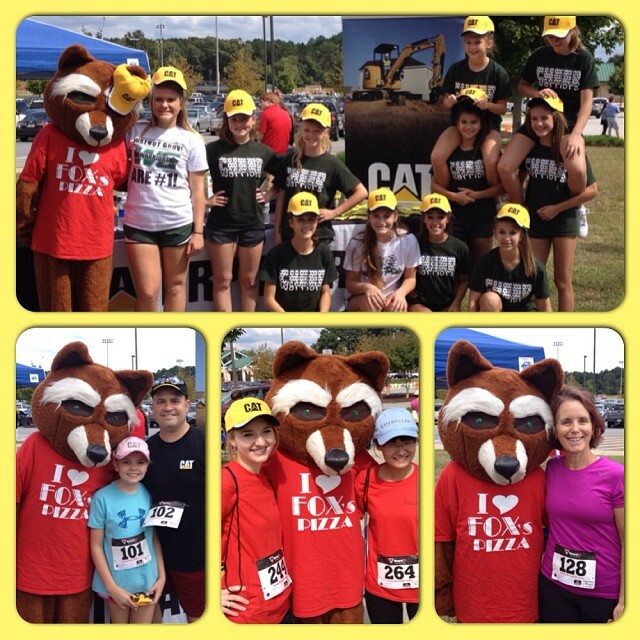 We were very excited to be joined by most of the Fox’s team, plus Frankie the Fox’s Pizza Fox! as the convertible pace car! 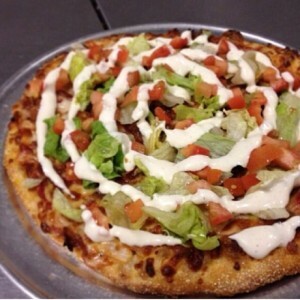 Who’s up for a Cinco de Mayo taco pizza or salad?! 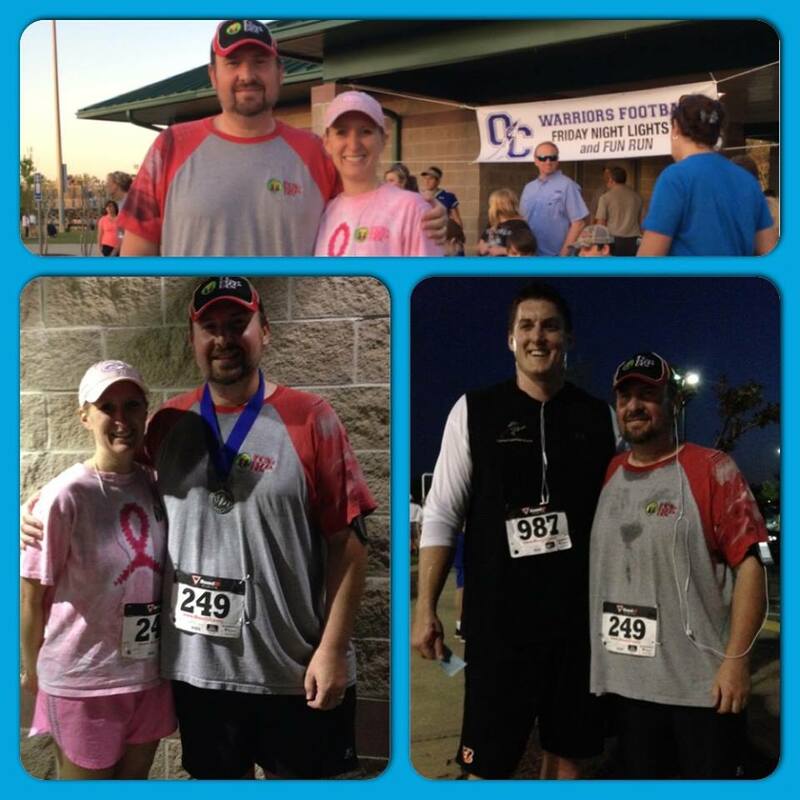 April 26th 2014 – Team Fox Rocks had a great time supporting the inaugural Oconee County High School Warrior Football Friday Night Lights 5k! Running with UGA Dawg alum Dennis Roland and the students with a 2nd place finish was a blast! 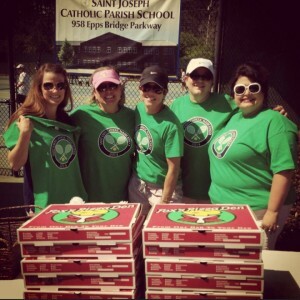 April 13th 2014 – Community photo of the day from the St. Joseph Catholic School Athens tennis tournament! 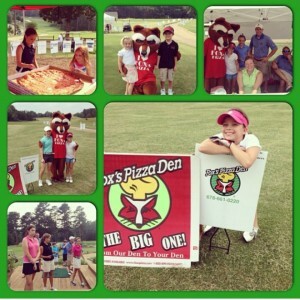 Happy to provide Fox’s pizzas for this awesome event. Congratulations to all participants! 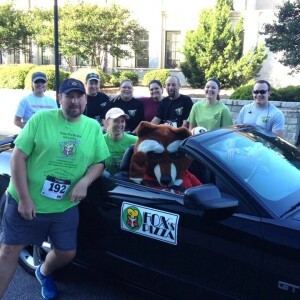 April 12th 2014 – Team Fox Rocks and friends supporting St. James UMC – Athens, GA Missions fundraiser 5K and getting moving! Glad we had transportation to Fox’s for lunch, and didn’t have to run there too! 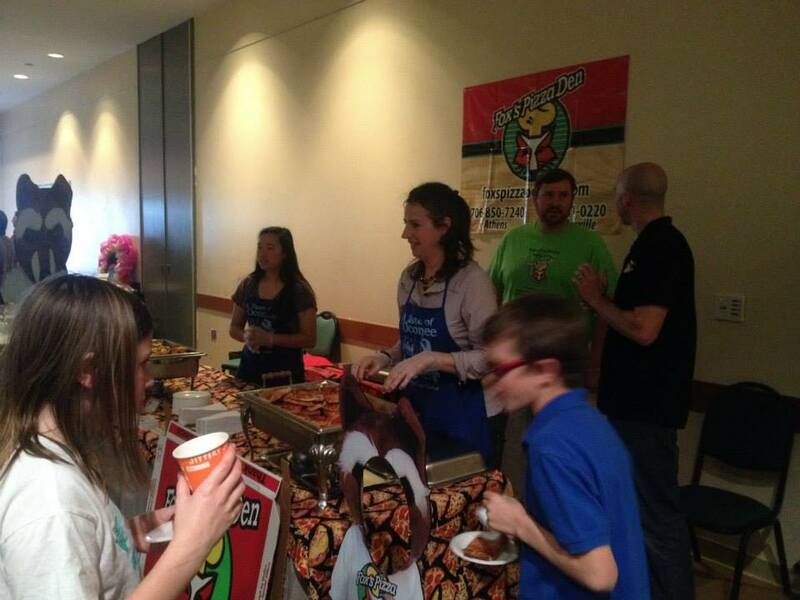 April 11th, 2014 – We had fun with volunteers at Athens First United Methodist Church serving pizzas and salads at the Souper Suppers dinner for those in need! Thanks for your service! March 30th, 2014 – Fox’s and Phickles yesterday at the Georgia Children’s Chorus Tour of Kitchens! 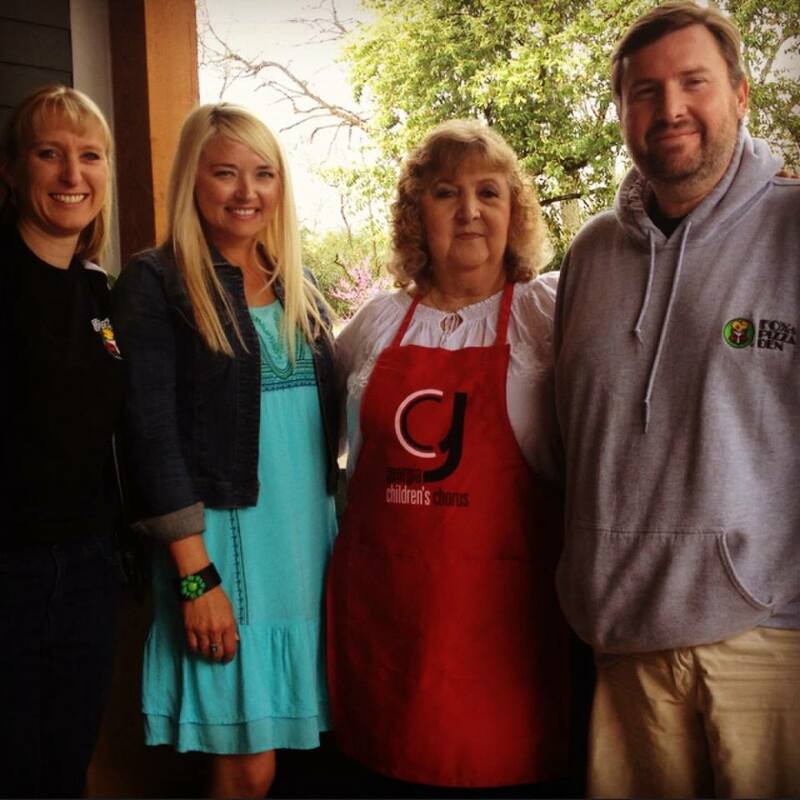 We are happy to support the GCC, and enjoyed catching up with our friends at Phickles Pickles to plan new menu items! While most were understandably sleeping, Team Fox Rocks, the Athens First Bank team and lots of friends of Fox’s were supporting Action Ministries Athens at the Lead Athens Midnight 5K! We even added to the 2014 hardware with a 1st in age group/women award! 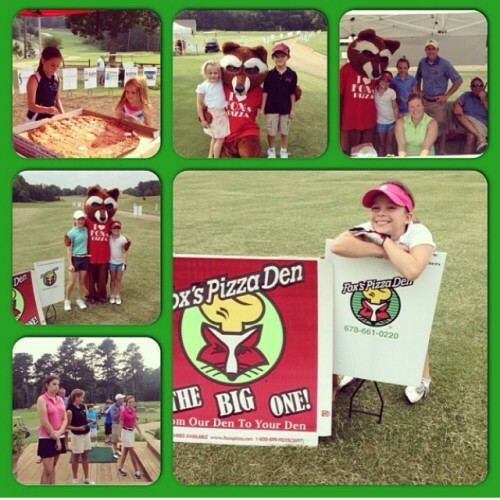 Fox’s hosted the Athens Area Junior Golf Tour for a Fox’s fundraiser on Thursday. Lots of area golfers and families came together to help raise funds for the AAJGT. Thanks to all those that supported this worthwhile cause! Team Fox Rocks well represented at the Prince Avenue Christian School (Official) Running with the PACS 5k, with several 1st, 2nd and 3rd place finishes! Now on to Fox’s to re-charge! Fox’s was recognized as the longest running participant in the annual Taste of Oconee fundraiser for Oconee County Middle School fine arts program. We’re happy to support this event, and had a great time seeing so many regulars and new friends. Hopefully, everyone enjoyed the samples! 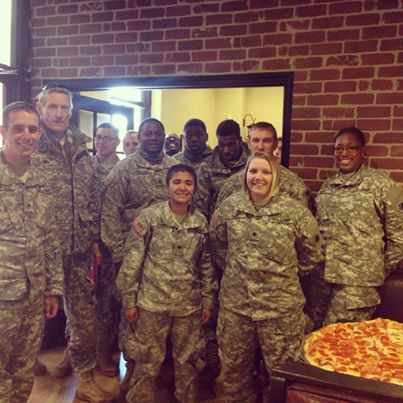 We were honored to treat some of America’s finest to a 30″ “Biggest Pizza in Town” lunch in a warm restaurant! Thanks for all you and everyone supporting the area have done to help the community through the winter storm! Thanks to all the teams that participated in today’s Coaches vs Cancer 3 on 3 fundraiser, and congratulations to the winning teams. 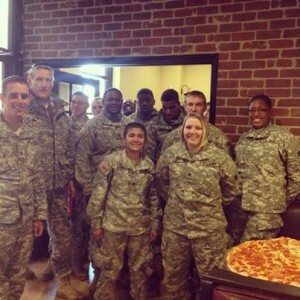 Each winning team received a free 9″ pizza monthly for a year! 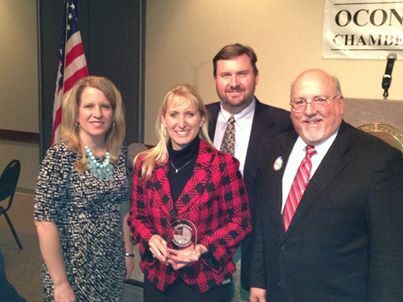 We are so honored and humbled to be named 2013 Oconee Business of the Year by the Oconee County Chamber of Commerce! We are blessed to have a quality Fox’s team, and be in a community with so many wonderful and supportive families, businesses and organizations. We sincerely appreciate you. 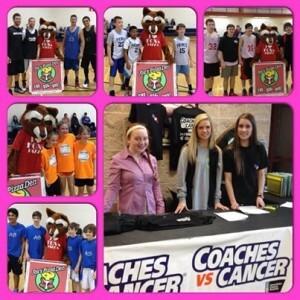 Great game and Coaches vs Cancer fundraiser at the OCMS v MBMS game! 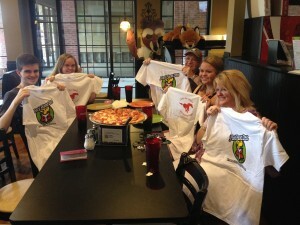 Congratulations winners of a 30″ “Biggest Pizza in Town”! 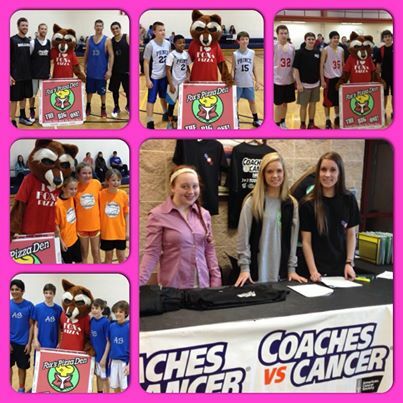 Team Fox Rocks was glad to be a part of this year’s Coaches vs. Cancer community fundraiser and cancer awareness event. Celebrating a wonderful time of year with our wonderful Fox’s team. Thanks for all you do for customers/friends of Fox’s! 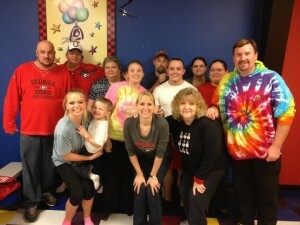 Special thanks to our friends at Pump It Up of Athens for hosting our party! Team Fox Rocks is happy to support our community with an annual meet and greet with Santa event at Fox’s! 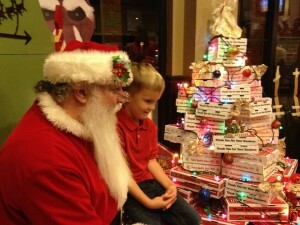 Free face painting, photos with Santa and more entertainment highlighted the evening. We enjoyed seeing everyone, and hope you enjoyed this holiday tradition!